-First, its Sale-A-Bration!! You know what that means, for every $50 spent on merchandise you get to pick something out of the sale-a-bration brochure. Lots of great goodies in there. Stamps, paper, and even a punch. You can also pick from a select group of stamps that are in the current catalog. How awesome is that! -Next, we have the new occassions mini. Just when you thought things couldnt get any better... SU proves us wrong. New punches, I call them space savers. They fold up and ultimately save space. We also have acrylic blocks. You have the option of ordering your stamps on wooden blocks or ordering them off the blocks and using them on acrylic blocks. Again, this saves space! I love that because I dont have a ton of space so I think this is just so Amazing! -Third, I am starting a frequent stamper card. For every $25 you spend you get a punch off of your card. Once you fill the card, you get $10 in free merchandise of your choice. -Fourth, Button and Ribbon Shares..... What does that mean? For $18.63 you will receive 3 yards of 9 different colored satin ribbons. Thats a total of 27 yards of ribbon (81ft) of ribbon. For $9.60 receive 6 corduroy brads of 2 colors, for a total of 12 corduroy buttons/brads and 4 epoxy brads of 3 colors for a total of 12 brads. -to order any of the shares call or email me. my email is laura0202@hotmail.com and phone is 413-834-1932. 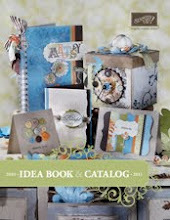 To view the spring mini or the Sale a bration catalogs click on the link on the right side of the page. 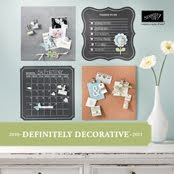 -last but not least, there is a new insert for the definately decorative catalog. We have some really great stencils and new vinyls. After all this gab, here is a card that we will be making at my class on the 23rd. If you would like to join us the class fee is $10 and its at my apt in turners. We will be learning a new technique and using new stamps, paper, and punches from the mini. Call or email me to RSVP as soon as possible.